When I am asked what the most important part of setting up a shoot is, I always say “communication.” As far as I’m concerned, nothing can be more frustrating during the preparation, actual shooting, or post shoot than poor communication. Everyone ends up confused, it can contribute to drama usually through misunderstanding, and is simply not in any way helpful to anyone in the industry. 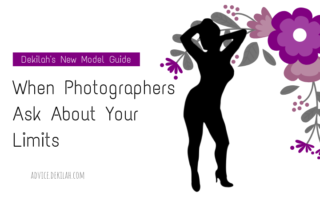 Note: While this is written from the perspective of a model, it can be helpful for photographers too. Sometimes I also add in a short bit about how my nails will be done, personal grooming (if relevant), and any other concerns I might have. Anything I can do to eliminate confusion, especially on common issues, I will try to cover. Another very important thing to communicate about is the product of the shoot, particularly if you have specific expectations. A few things you may want to discuss are the number of photos you will receive, how will the photos be delivered, how long does the photographer expect they will need before they can deliver photos, etc. Many photographers will give this information on their MM profiles or in initial messages, but, if not, it should perfectly acceptable for you to ask prior to the shoot. And please do ask before the day of the shoot if this is a concern or if you have any questions. Communication after the shoot can be important too. I try to send them a message within a couple days of the shoot if they don’t contact me first. Models, if you’d like to check in on your photos after a week or so, you can send a nice, upbeat message saying again how much you enjoyed the shoot and that you can’t wait to see the photos. Don’t be pushy, be friendly. It takes a while even to do simple work on just a few photos. And chances are yours isn’t the only photo shoot they have to edit. Obviously, all models & photographers are different and some of us like to communicate more than others. Some people like to keep it short and sweet, some (like me) prefer to discuss things to make sure the details are covered. I think the key is to find out what works for you.